When we search the scriptures in the same Spirit by which they were given, we gain a greater understanding of God’s will. On March 1, 1845, Elder Wilford Woodruff, who was then serving as the presiding Church authority in the British Isles, received a letter from a friend in the United States. Included with that correspondence was a copy of another letter, in which a man outlined a plan to print the Doctrine and Covenants in England and secure the copyright there for himself. This man’s action would have prevented the Church from printing the book in England. Elder Woodruff wrote in his journal: “This certainly is a bold move, for an apostate or apostates to undertake to print the works of the Church and rob them out of it. I view it [as] nothing more than the mercy of God in putting the knowledge of this thing into my hands. I spent the day in examining the law to see what I could learn concerning securing copyrights.”1 He hired a printer to typeset and print 3,000 copies of the book.2 Then, having gained an understanding of British copyright laws, he secured the copyright in his own name on June 7, 1845, “in forty-eight hours after the last sheets were obtained from the printers.”3 Thus he preserved the Church’s legal right to print the book in England. This was not the first time Wilford Woodruff worked to get the scriptures into the hands of the Latter-day Saints. Before the Doctrine and Covenants was ever printed, he copied many of the revelations by hand and took them on his missionary journeys. While he was serving his first mission in England, from January 1840 to April 1841, he worked with President Brigham Young and others to publish the first edition of the Book of Mormon outside the United States. He later assisted the Prophet Joseph Smith in Nauvoo, Illinois, setting type for the Church’s periodical titled Times and Seasons. Between March 1, 1842, and January 16, 1843, the following documents appeared in the Times and Seasons, many years before they were published in the Pearl of Great Price: the book of Abraham; Joseph Smith—History; the Wentworth letter, which contained the Articles of Faith; and a portion of the book of Moses. We must study the truths in the scriptures, treasure them in our hearts, and practice them in our lives. The Bible and Book of Mormon join to proclaim the fulness of the gospel. The Doctrine and Covenants is our testament in the latter days. The Book of Commandments, an early compilation of revelations to Joseph Smith. This copy of the book contains Wilford Woodruff ’s signature. The Pearl of Great Price contains glorious truths revealed to the Prophet Joseph Smith. Note: For much of Wilford Woodruff’s life, the Pearl of Great Price was not one of the standard works of the Church. However, its teachings were widely read by the Saints, with excerpts first published in some of the Church’s periodicals. On October 10, 1880, the Pearl of Great Price became a standard work of the Church by action of the First Presidency and by a sustaining vote in general conference. 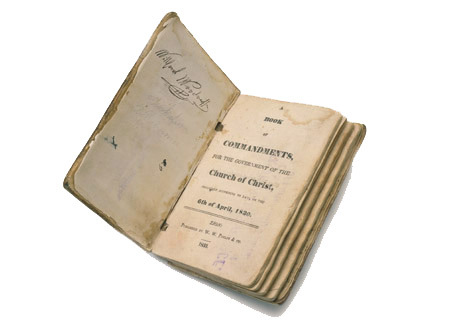 In the following excerpts from his journal, Elder Woodruff expresses his testimony concerning the book of Abraham, which the Prophet Joseph Smith translated by the power of God and which was later included in the Pearl of Great Price. The prophecies in the scriptures can help us prepare for the events of the last days. “Who am I, saith the Lord, that I command and am not obeyed? Who am I, saith the Lord, that I promise and do not fulfill?” [See D&C 58:30–32.] … We have said, time after time, and year after year, that we live in a very peculiar age, generation and dispensation, and this is true. Time rolls on, carrying with it its events, and fulfilling the revelations of God, unto us especially. We live in a day of darkness; unbelief and infidelity are covering the whole face of the earth. … It astonishes the Latter-day Saints to see the amount of darkness and infidelity that are abroad in the earth. Hence, as Latter-day Saints, I think it requires on our part an increase of faithfulness in the practice of our religion, and in the various revelations of God contained in the Bible, Book of Mormon and Book of Doctrine and Covenants. What do you think it means to read the scriptures “by the same Spirit by which they were given”? (page 117). Review the first paragraph on page 118. How do the scriptures offer protection from the influence of the devil? In the second paragraph on page 118, President Woodruff counsels us to do three things with the scriptures. Why are these actions important? What impresses you about President Woodruff’s testimony of the Doctrine and Covenants? (See pages 120–21.) In what ways is the Doctrine and Covenants “our Testament”? Wilford Woodruff said that the truths in the book of Abraham are “rich treasures” (page 122). What treasures have you found in the Pearl of Great Price? What have you done to make your scripture study meaningful? 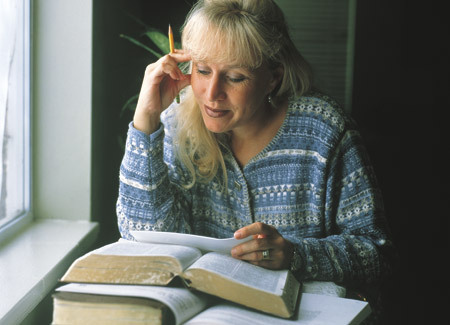 What scripture passages have been particularly helpful for you? How have these passages helped you? How can parents, grandparents, and teachers help children and youth study the scriptures and apply them in their lives? Journal of Wilford Woodruff, March 1, 1845, Archives of The Church of Jesus Christ of Latter-day Saints. See Journal of Wilford Woodruff, June 7, 1845. History of the Church, 7:426; see also Journal of Wilford Woodruff, June 7, 1845. Millennial Star, November 21, 1887, 742. Deseret News: Semi-Weekly, July 6, 1880, 1. Deseret Weekly, August 17, 1889, 226. Deseret News: Semi-Weekly, September 7, 1880, 1. Deseret Weekly, September 21, 1889, 394. Deseret News: Semi-Weekly, March 26, 1878, 1. “Mormonism Brought Prominently before the Public,” Millennial Star, August 5, 1897, 493. Deseret Weekly, April 19, 1890, 560. Deseret News: Semi-Weekly, May 2, 1876, 4. Deseret News: Semi-Weekly, May 20, 1873, 1. Deseret News: Semi-Weekly, August 16, 1881, 1. Millennial Star, November 10, 1896, 741. Deseret News: Semi-Weekly, July 26, 1881, 1. “The Keys of the Kingdom,” Millennial Star, September 2, 1889, 548. Journal of Wilford Woodruff, February 19, 1842. Journal of Wilford Woodruff, March 19, 1842. Deseret News: Semi-Weekly, July 20, 1875, 1. Deseret News: Semi-Weekly, July 30, 1878, 1.